Tell us the story of your project – What was it about? Who was involved? How did you begin? As the artist developing the public art project Dublin Ships (commissioned by Dublin City Council) I wanted an engagement project to run in parallel within the duration of the art work. Dublin Ships was a temporary public artwork generated via a live electronic information system (AIS) which tracked the locations of ships coming in and out of Dublin Port. The names of the most recently arrived and most recently departed ships from Dublin Port were displayed on two large LED screens sited at the Scherzer Bridges close to the Samuel Beckett Bridge over a nine month period. The artwork was concerned with the meanings and poetic qualities of ship names which included references to maritime trade, cargoes, historical figures and distant places. Together with the commissioners, Ruairí Ó Cuív and Liz Coman, we decided to work with children living locally who were potentially experiencing the artwork, in their day to day lives, over the extended period of time. We approached three experienced and innovative people, artist Martina Galvin, visual arts educator Katy Fitzpatrick and philosopher Aislinn O’ Donnell to work on the project. All of them had existing or previous relationships with the schools in the area and a familiarity with the locale. The initial framework for our planning was finding different ways to enable students to respond to ideas prompted by the artwork. Through collaborative team planning and an ongoing dialogue, we designed a series of four class group sessions, which included using verbal discussion, hands-on making, notebook work and an experiential field trip. As I was at the philosophical discussions in the classrooms, and as mesmerised as the children on the port visits, I was able to gauge what areas to focus on in the workshops in the classrooms. Although I concentrated on the children creating their own public art work for the port, there were many strands that could be expanded on in an artistic and creative way. How were the ideas developed and how did the young people, artist and teacher work together? 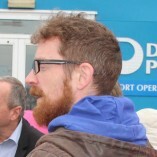 The engagement project was developed with four schools on both sides of the Liffey. Therefore the fact that many of the students had an existing awareness of the artwork was very helpful in terms of generating discussion and bouncing ideas around as the project progressed. The project began with discussions led by Aislinn and Katy, which explored the potiential for many different forms of art and was an important springboard for opening up thinking at the start of the project. This initial part of the project also included imagining and speculating on the visible and invisible elements of signal and communications based technologies that surround us in our everyday lives. This sowed an important seed for later abstract drawings. During the initial phase of the project there was a field trip to the port with Martina Galvin and Charlie Murphy, Communications Manager of Dublin Port Company. This visit allowed the young people to see behind the walls of a facility close to their locality and also to see operations in the control room. The port visit was a very exciting experiential highlight. One group got to see the arrival of a large cruise ship “Carribean Princess” up close from within the control room. This particular school is opposite the port and regularly sees shipping traffic at a distance from the windows of the school across from the other side of the river. After these discussions, children worked with visual artist Martina Galvin to come up with initial ideas for their own public artworks. These included many imaginative responses, some of which also took the form of experiences or tours. Other suggestions included artwork for 3 dancers, a skatepark as an artwork, an artwork that might take you back to the time of the dinosaurs, as well as artworks designed for specific locations. The young people kept individual project notebooks to store their ideas and gather their research. Myself and Martina discussed with the children the ways in which artists’ use notebooks. We brought some examples of our own notebooks to show them. The use of personal notebooks was a simple but very effective methodology giving students some sense of agency and personal investment in the project. Back in the classrooms, we used photographs recorded by Martina as prompts to jog pupil’s memories and to initiate discussion of their experience of the port and to recount what it was like to see behind the scenes. The “notebook’ as the collector of this rich array of materials and ideas, was a great way to give the children individual freedom but yet not lose their responses and creative ideas. I did provide them with a rich and diverse set of materials in the workshops, and this definitely helped move them from ‘traditional illustrations’ of what they saw, to developing imaginitive ideas. I took extensive photographs of the port trips and re visited the trip using these photographs to bring the port back to the classroom – ensuring we were not working from a blank canvas. For instance, they had a “smell” page in the notebooks and they put drops lavender or lemon grass oil on their notebook page. This corresponded directly back to the very, very strong smell of the grain storage depots in the port. We were all in awe that this grain is the only source of wheat for all the bread made in Ireland that we all consume!! They also wrote out ideas, as I emphasised that ideas can be thought and written, not necessarily made. This allowed greater creative freedom. There were numerous examples of very individual responses, and I think that was part of the highlight of the project for me – enabling the children to have very individual creative process free from the necessity to materialise an idea. What I loved most was how the project utilised the children’s surroundings to inform and lead the project. The children and I experienced things that we never would normally and all of them being on our doorstep. This included learning about Dublin Port and Dublin Ships. It was a thoroughly enjoyable project. After the port visit some teachers initiated project work in classtime that happened between the port visit and the artist sessions. Some extraordinary abstract sculptural and graphic elements which grew out of material exploration and the discussion of visible and invisible elements. What aspects of the project made you smile? What aspects of the project made you feel challenged? 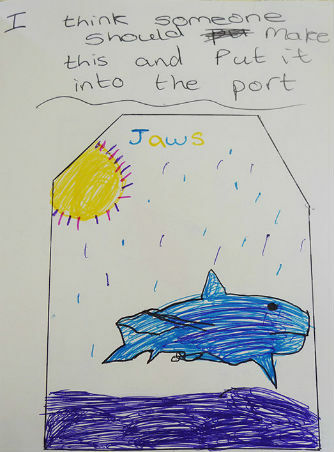 The children’s discussions and descriptions of the port visit were really lovely. Highlights included the strong smell of grain being delivered, the control room itself, looking through binoculars out to sea, talking to an incoming ship, and speaking/singing through megaphones. One challenging aspect was the sheer volume of work generated over the course of four sessions with facilitators. The children produced a vast amount of material that illustrated their thinking and responded to ideas and materials. The editing was quite a challenging process and a little unwieldy. At the initial stage of the project we were unsure exactly what form the final output would take, in retrospect our job would have been easier if we had some clarity on final form earlier. While the project was happening the four teachers involved were very committed and active collaborators. Some of the teachers kept discussion going and came up with complementary activities which happened in the time between sessions. After the summer break it was challenging to re-engage the schools in the project as three out of four of the teachers involved were on leave of absence and new teachers were starting with the class groups. These teachers had not experienced the main aspects of the project and so picking up and further developing themes encountered was very difficult. What insights from the project are worth sharing? Working in parallel and with support from the other practitioners and supportive teachers was really crucial and drove the engagement project. I compiled the collated information into an ‘Online Showcase’ which offered an overview of some of the key questions we explored. We tried to give a flavour of our approach, which we compiled from audio recordings together with images and drawings by the participants. Myself and Liz Coman returned to one class group to show them the online showcase and receive their feedback. In this discussion the impact of the project was obvious as the children shared strong visual and verbal memories of their experience. The importance of the use of notebooks as a tool to gather thinking as research was commented on by the children. When we showed the online showcase to the children we discussed how I had selected images and sound pieces from a vast amount of content – curating their work in a sense. With a longer engagement time we could have developed this aspect of choice and curation of the content more directly with the children. The collated images of their drawings into video clips got strong responses from the children. A silent image sequence of their abstract drawings stimulated a huge level of quiet concentration and seemed one of the most effective ways of collating this information for group response and class room use. Has anything changed as a result of the project? For me as an artist the project enabled mediation and discussion of the public art work with the local school community. It also provided valuable feedback and helped us gauge on some level the effectiveness of the public art project overall. Children also engaged in discussions with parents or grandparents around the work and also helped to mediate the work to the wider community for us. The engagement project also introduced the children to the inner workings of the port, a space which is in their backyard and which has a legacy in their community. They engaged directly in discussion of what ships come in and out, the cargo involved, and the names of ships. The project introduced children to the concept of different forms contemporary art work can take. 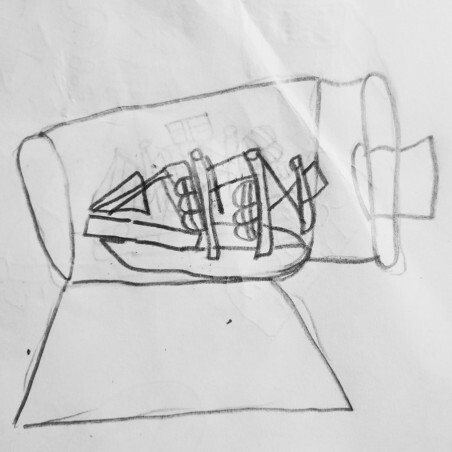 The project also allowed children time and space to make a creative response to their experience of the visiting the port, seeing the artwork and understanding how it was made. 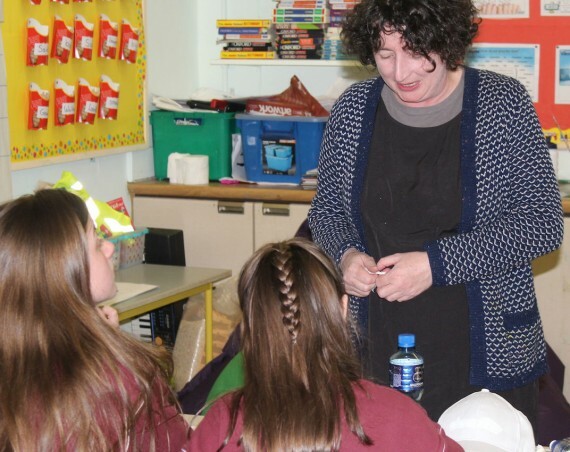 The collaboration between the creative facilitators, the teachers and staff of Dublin City Public Art Programme, Dublin City Arts Office, and Dublin Port enabled a degree of peer to peer learning with different areas of expertise coming together to support the children’s experience. I work primarily with technology and sculpture in a gallery context. My work investigates systems of technology, and infrastructure by engaging directly with its physicality. Dublin Ships was my first major piece of public art. I have a background in museum and gallery education and I worked for a number of years as a freelance artist & workshop facilitator for the Education and Community Department at IMMA whilst also doing sessional work for a number of community and art organisations. Currently I work as a third level educator in in Fine Art Media at NCAD. I am increasingly interested in thinking about the different ways of mediating art work for the wider public. This was one of the reasons I felt it was very important to have an engagement project run in parallel to Dublin Ships. The Butler Gallery (audio-describe one exhibition every year. 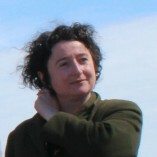 The process was facilitated in partnership with Arts & Disability Ireland (http://adiarts.ie/) , with funding from the Arts Council (http://www.artscouncil.ie/home/). The project engaged with children in response to a public artwork. It explored questions about potential forms of art & public art as well as themes relevant to the work such as technology, infrastructure, philosophy, locality. What I loved most was how the project utilised the children's surroundings to inform and lead the project. The children and I experienced things that we never would normally and all of them being on our doorstep.